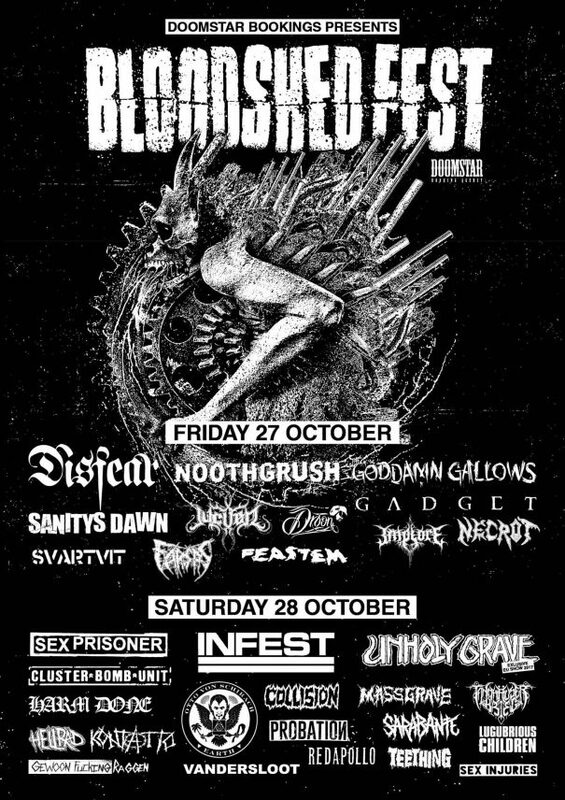 Bloodshed Fest 2017 will take place at Dynamo club in Eindhoven, Netherlands on October 27-28, 2017. Disfear, Infest and Unholy Grave are among the bands that will perform at Bloodshed Fest 2017 festival. Psycho Las Vegas 2016 will take place at Hard Rock Hotel and Casino in Las Vegas, USA on August 26-28, 2016. Candlemass, Down and Pentagram are among the bands that will perform at Psycho Las Vegas 2016 festival. Temples Festival 2016 will take place at Motion in Bristol, United Kingdom on June 2-5, 2016. Melvins, Acid King and BongRipper are among the bands that will perform at Temples Festival 2016 festival. SWR Barroselas Metalfest 2016 will take place in Barroselas, Portugal on April 22-24, 2016. Aborted, Marduk and Grave are among the bands that will perform at SWR Barroselas Metalfest 2016. Temples Festival will take place at Motion, in Bristol, UK on May 2-4, 2014. Electric Wizard, Neurosis and Clutch are among the bands that will perform at the Temples Festival 2014 festival. SWR Barroselas Metalfest XV will take place in the small village of Barroselas, in the north of Portugal on April 26-30, 2012. Immortal, Candlemass and Gorod are among the bands that will perform at the SWR Barroselas Metalfest XV festival. Roadburn will take place at the 013 venue and Midi Theatre in Tilburg, Holland from Thursday, on 12-14 April, 2012. Voivod, Yob and Killing Joke are among the bands that will perform at the Roadburn 2012 festival. Durbuy Rock Festival will take place in Bomal-sur-Ourthe, Belgium on May 13-14, 2011. Triptykon, The Haunted and Loudblast are among the bands that will perform at the Durbuy Rock Festival 2011 festival. Maryland Deathfest is a death metal festival held annually in U.S.A. since 2003. The 2010 edition will take place in Baltimore on May 28-30. Kreator, Triptykon and Dying Fetus are among the bands that will perform at the SWR Barroselas Metalfest XIII festival held in Barroselas, Portugal on April 30 – May 2, 2010.